Special Agent Tony Chu is a cibopath: every time he eats something, he has a psychic vision of where that food came from, whether an orchard or slaughterhouse. As a result, he doesn’t tend to eat very much (except for beets, which as a vegetable seem to have zero background personality). His unfortunate mission? To chase down illegal chicken-traffickers for the Special Crimes Division of the US Food and Drug Administration (poultry have been outlawed since the bird flu that killed 23 million Americans three years ago) and, when necessary, chomp on the living or dead parts of criminals in order to find out their dirty little secrets. Along the way, he manages to lose his partner to a flying meat cleaver, nearly gets his brother killed, and draws the attention of some very nasty crime bosses who put a price on his head. All while being very, very hungry and never able to eat anything that doesn’t give him nightmares. You think your job is hard? Just try being Tony Chu for one day. 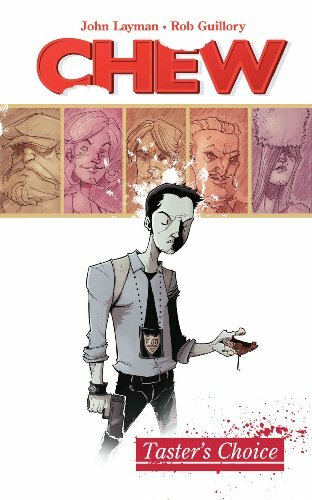 This wholly original GN earned a rightful place on ALA’s 2011 Great Graphic Novels for Teens list, and a permanent place in my heart for its black humor, snappy dialogue and utterly awesome grossness. This one has everything from projectile vomiting to hamburgers with human finger condiments. It’s not an overstatement to say you’ll laugh ’til you puke–or at least throw up a little in the back of your mouth. When world-weary ghost wrangler Frank Gallows accidentally zaps terminally ill Garth Hale into the in-between dimension of Ghostopolis, the boy finds himself with a new lease on life—or death, as the case may be. As a human being in this spirit world, Garth discovers he has incredible powers that are capable of overthrowing Master Vaugner, the evil Goth dictator of Ghostopolis. But Garth just wants to get back home. Aided by Skinny, his skeletal Nightmare and the friendly ghost of his dead grandfather, Garth almost gets his wish when Frank Gallows and the beautiful ghost mechanic Claire Voyant show up with a machine that can zoom him back into the land of the living. But Vaugner isn’t letting Garth leave until he finds out the secret of his strength and takes it for himself. Soon Garth, Frank and Claire find themselves caught up in the midst of an epic battle for the heart and soul of Ghostopolis. Folks, this is one of those “kitchen sink” books (as in, author and illustrator Doug TenNapel threw in everything but the kitchen sink) that shouldn’t work but it does. There’s action, giant lightning bugs, adventure, a mysterious Tuskegee Airman named Joe, romance, the ghost of Benedict Arnold, side-splitting humor, and a farting werewolf. Somehow, it all comes together and makes perfect sense. I enjoyed every manic moment of it. Don’t believe me? Check it out for yourself—it should be widely available at your local library as it was one of ALA’s 2011 Top Ten Great Graphic Novels for Teens. You’ll also want to be in the know before the planned feature film hits theaters!